Much has been written over the past 54 years about the continual development of Porsche’s now iconic 911. Recently relaunched, and now in only its 8th incarnation the 911, (Or is it actually the 901, 930, 934, 964, 993, 996, 997 or 992 now?) is very much a car that has evolved rather than one that has been continually re-invented. It really is a legend in its own lifetime, and in becoming such, has developed a huge army of ever-devoted fans. But, the 911 is not the only car to do such a thing. 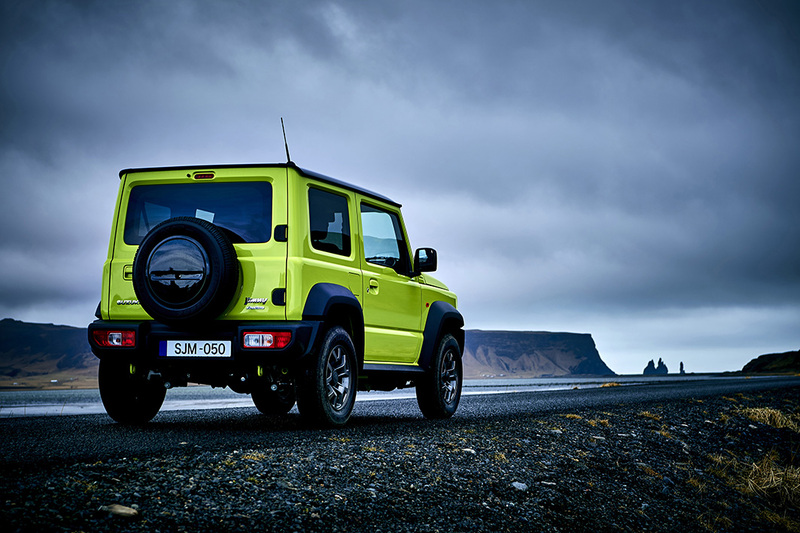 The car you see before you is the new Suzuki Jimny. And if recent after-dinner conversation is anything to go by, it is every bit as equally anticipated by those-in-the-know as anything Stuttgart can muster. 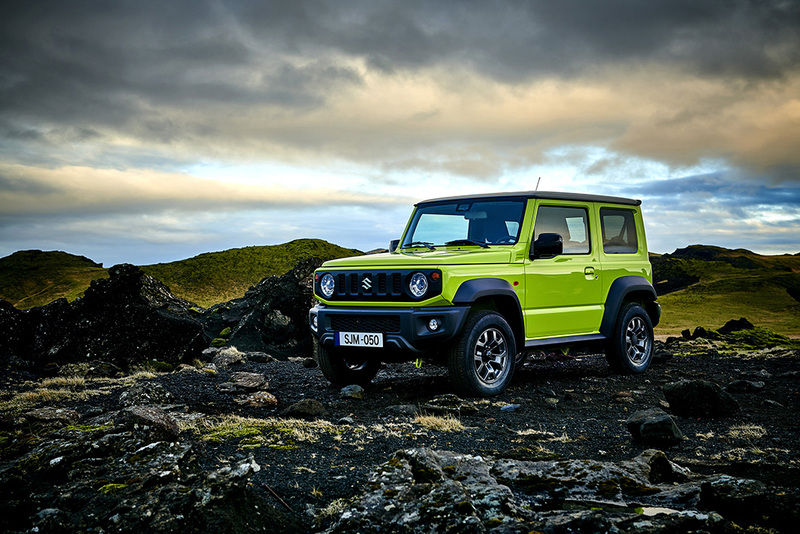 The Jimny can trace its roots back to 1970’s LJ10, and despite now being close to 50, is actually only in its fourth generation. The outgoing Jimny – the one you’re no doubt very familiar with – was brought to market way back in 1998 and has been little changed since then. Nevertheless despite its near-glacial development Suzuki still sold approximately 1,500 of them a year in the UK. That’s more than 42,000 in total. And that’s with no advertising whatsoever. Like the 911, people swear by them; more often than not, replacing their old one with a new one. So then, how do you go about building an all-new version of such a thing? Notice the use of all-new. For that is exactly what this new Jimny is. The basic layout of Suzuki’s little 4×4 halo-car stays the same (can you imagine a front engined 911?). So, there’s a ladder chassis – albeit a now significantly stronger and torsionally stiffer one, 2-doors, 4 seats, a squared-sided body and flat roof – so you can brush any snow off more easily apparently, – the spare wheel is still mounted on the side-hinged back door, and proper, selectable, four-wheel drive complete with low ratio transfer ‘box’ – something Suzuki now call AllGrip Pro – is, of course, standard fit. Sizewise this new Jimny differs little from the car it’s replacing; it is in fact just 20mm higher, 45mm wider (that helps with stability) and believe it or not, 30mm shorter. Luggage space therefore – unless you’re prepared to travel with either one or both of the rear seats folded flat and thus utilise their wipe-clean chequer-plate plastic backing whilst simultaneously turning the Jimny in to what is in effect a relatively capacious van – is tight to say the least. At least you get a flat loading lip. So far then, so Jimny. But twenty years of progress haven’t accounted for nothing. If you’re used to the bucking and crashing way an old Jimny rides, you’ll find this new one a complete revelation. The short wheelbase does mean it does still hop around a little, and should you go barrelling into a corner with too much enthusiasm there’s still a generous helping of body-roll on offer. That said a two hour drive in the new car compared to the same in the old one, is to use the old adage, chalk and cheese. Not only can you hear yourself think in the new Jimny, you can hear your passenger too! Not that you’ll be going anywhere particularly fast that is. Power – a modest 100bhp – comes from a 1,462cc inline four that’s coupled to a rather lovely old-fashioned feeling long-throw 5-speed gearbox. 0-62 mph takes around 12.6 seconds and some short ratios mean motorway cruising speeds equate to in excess of 3,000 rpm. Overtaking too, requires planning. Best if you just set the sat-nav, turn-up the DAB, the aircon, and the heated seats, and relax a little. But as always the Jimny’s trump card is not the way it behaves on the road, but rather the way it copes when off it. Stop, pull the stubby lever behind the gear-stick back a notch, and then press down and pull it back another, and you’ve selected low-ratio 4-wheel drive. You’ve also transformed the Jimny into a four-wheeled mountain goat; even on its factory-fitted road-biased tyres it will go almost anywhere you care to aim it. Short overhangs both front and rear, plus the Jimny’s brake LSD traction control, and hill descent control, mean there’s simply nothing else on the market for this kind of money that’ll get you so far away from the tarmac and safely back again. And what exactly is this kind of money? The Jimny starts at £15,499. It’s not without its flaws. It’s still a little thirsty, and a tad heavy CO2 emissions-wise. And it’s still neither a relaxed cruiser, nor the perfect family car. There’s many a suburban SUV that’ll play those roles better – Suzuki’s own refreshed Vitara for instance; especially so now they’ve redesigned the interior. But for what this new Jimny offers, for its off-road prowess, and for its unashamedly cute retro and shrunk-in-the-boil-wash Land-Cruiser styling, I genuinely think it’s a bit of a bargain. Be quick though. Demand I’m reliably told is beginning to outstrip supply (there’s a 9 month waiting-list already apparently). As someone who owns a 2005 Jimny, uses it almost daily, and swears by it when the weather takes a turn for-the-worse, I really can’t say I’m surprised. I’d swap if for a 911 though, should anyone reading this be interested? Many thanks to everyone at Suzuki’s UK press office.